A lot of you drive over the Catawba River every day and probably don’t give it much thought. Or maybe you catch a glimpse of the fall foliage or the steam rising from the river some summer mornings as you brave 85 on the way to work. The truth is that the Catawba was here long before any of us, and hopefully, will be here long after we are long gone. Named after the Catawba Indian Nation, the Catawba has been a major factor in the history and development of the region since pre-colonial times. During the 19th century, the Catawba was briefly made navigable through the construction of a canal system.During the 20th century, dams were created to create power for the emerging textile and other industries, as well as to provide drinking water. Today, the Catawba-Wateree Basin is one of the fastest growing areas in the United States, and the Catawba-Wateree River is used for power production, industry, agriculture, drinking water and recreation. Duke Energy, one of the world’s largest utility companies, holds the primary responsibility for managing the reservoirs and regulating development on the River. Unfortunately, there are four major dangers to the river, and Duke Energy is involved in two of those- coal ash and what’s called the energy-water nexus, or the stress that energy production puts on the river. The other two are storm water runoff and CAFO’s, which are “concentrated animal feeding operations” such as hog and poultry farms. Coal ash is a byproduct of burning coal to produce electricity. Within a 29 mile stretch of the Catawba River, near Charlotte, 120 million tons of coal ash is stored in unlined, impoundments (commonly referred to as coal ash “ponds”). These ponds sit adjacent to reservoirs (lakes) that supply over one million people with drinking water. North Carolina regulators ruled recently that Duke does not have to dig up and remove coal ash from seven locations deemed low risk, including the Allen steam station. Environmentalists counter that the only safe way to remedy the problem is the removal of the coal ash-that leaving the coal ash in unlined pits with a cap will not prevent toxic chemicals from leaching into the groundwater. Another issue is the expense, and whether Duke customers are on the hook for cleanup expenses. The energy-water nexus has to do with, among other things, the loss of water in the power production process. Although there has been an increase in the use of renewable energy sources, the majority of electricity is still generated by nuclear or fossil fuel plants, which consume large amounts of cooling water. According to the Union of Concerned scientists, the Catawba-Wateree River is the fourth most stressed river from power production in the United States. Every day, 75 million gallons of water are lost during the process of power generation on the Catawba River. An additional unknown amount of water is lost through evaporation after cooling water is discharged back into the river. With the incredible amount of new construction in Gaston, Mecklenburg and surround counties, storm water runoff has become a major issue. Impervious surfaces, such as roads, parking lots, and buildings cause major runoff. This runoff carries debris, chemicals, motor oil and sediment into urban streams and creeks – eventually, making its way to the lakes and river. Silt runoff from construction is another concern, especially at Lake Wylie. Because of the dam system, silt and runoff that go into the lake have nowhere to go. Many folks that live on the lake bemoan the loss of what were once open coves where the water is now feet lower than in previous years because of silt buildup. The CAFO’s or “concentrated animal feeding operations” have to do with large scale industrial animal feeding operations; again primarily hog and poultry operations. There are several concerns with CAFO’s, but primarily the runoff from improperly stored waste in these facilities and the amount of water they consume. 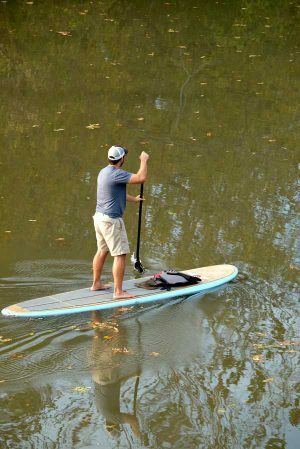 Fortunately, in spite of the concerns about power production and clean drinking water, there is still much fun to be had on the river. 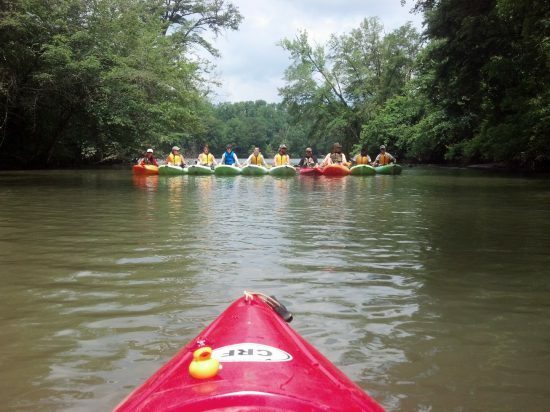 Boating-including paddle boarding, canoeing and kayaking are fun summer activities. There is also the Belmont Rowing Club. Fishing is another popular pastime with many varieties of fish, including bass, catfish, and perch, among others. 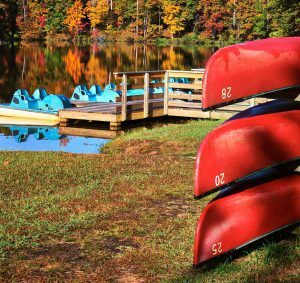 The river and Lake Wylie are favorites with many outdoor enthusiasts, who enjoy the river year round. We are truly fortunate to have this resource so close and accessible. Old Man River- the Catawba- he just keeps rollin’…but he needs our help. The river has been there a long time, but it needs our care and protection so that we, along with generations to come, can continue to enjoy this most precious natural resource. 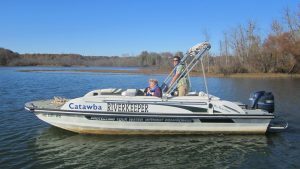 Special thanks to Catawba Riverkeeper Brandon Jones for his assistance with this article. Reach Brandon at brandon@catawbariverkeeper.org.